MUNICH — 2014–15 has been a rough transitional season for the Munich Philharmonic. Lorin Maazel’s sudden resignation a year ago forced its managers into much recasting, and some feeble programs. Then, midseason, came worse news. An irksome pact between Munich’s Bürgermeister Dieter Reiter and Bavaria’s Minister-Präsident Horst Seehofer nixed plans for a needed new concert hall to replace the Gasteig and instead envisioned a joyously slow disemboweling and inner rearrangement of that acoustically poor facility, which would leave the MPhil homeless starting in 2020. The pact sent Anne-Sophie Mutter, Christian Gerhaher and Mariss Jansons into public displays of betrayal, rage and frustration, respectively. But MPhil managers could not whine so loudly because the city owns the orchestra, so, a week behind everyone else, including the testy Bavarian Radio Symphony Orchestra (also affected), they emitted six splendid bureaucratic paragraphs saying absolutely nothing. 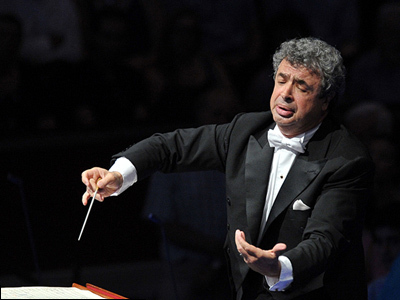 Somehow the musicians have ploughed through this temporum horribilis and on Monday (June 22) managed to sound confident and poised at the Gasteig under Semyon Bychkov. Grandly he propelled them in Brahms’s Third Symphony (1883) stressing contrasts and drama with wide arm gestures. Fine wind contributions, not least from principal horn Jörg Brückner, flattered the score’s textures, and Bychkov took a pleasingly weighty and leisurely approach to the middle movements, observing dynamic markings with care. Ravel’s G-Major Piano Concerto (1931) after the break found everyone on less sure footing, however, despite this being the program’s third iteration. Jean-Yves Thibaudet gave a dull, woolly account of the solo part. Ensemble weakened. The long concert remained in French mode for its conclusion, Debussy’s La Mer (1905), but this listener had to run. Tomorrow, the same partnership performs in the Pala de Andrè as a guest of the Ravenna Festival. MPhil 2014–15 closes fully with concerts here led by Kent Nagano and Krzysztof Urbański, but in September more headaches loom when Valery Gergiev takes over as Chefdirigent. Systems are supposedly in place to prevent the skimpiness of preparation associated with the new boss. It is unclear what, if any, measures are in place to cope with the political challenge. This entry was posted on Thursday, June 25th, 2015 at 11:33 am	and is filed under Munich Times. You can follow any responses to this entry through the RSS 2.0 feed. Both comments and pings are currently closed.